Stop what you’re doing. Right now. Go grab a pen and some paper. You’ve got to make a grocery list. 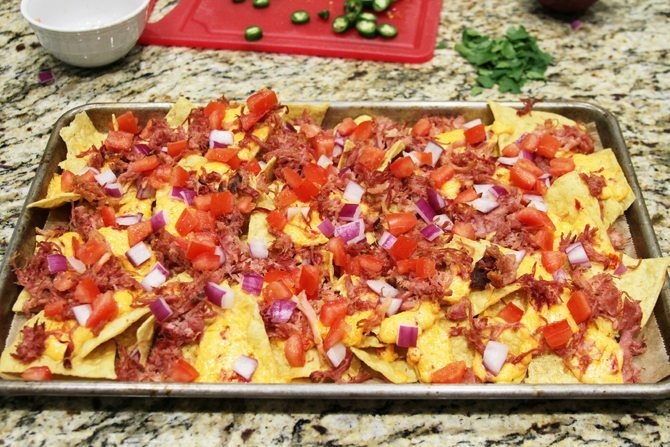 And on it, you need the stuff for these Southern Sheet Pan Nachos. Like now. Like right now. Often times, I’ll have an idea and there are flaws in the execution or final product. Not here. Nope. These are absolute perfection. Perfection, I say! 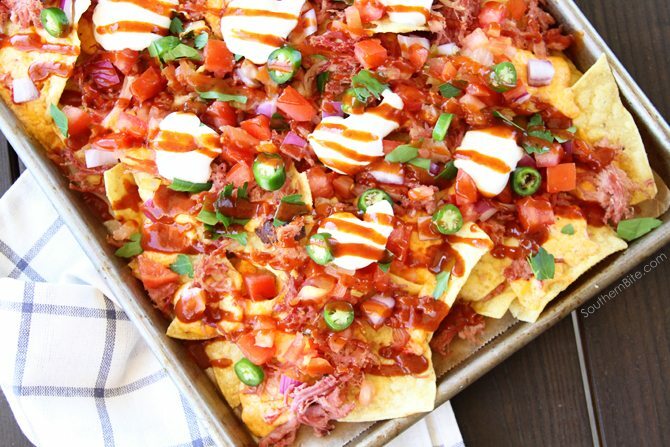 Melted Price*s Southern Style Pimiento Cheese Spread and smoky pulled pork combine on crispy, crunchy tortilla chips and are topped off with your favorite nacho toppings like red onion, Serrano chilies, tomatoes, sour cream, and then the whole thing is drizzled with BBQ sauce. Mercy! Let’s make some! 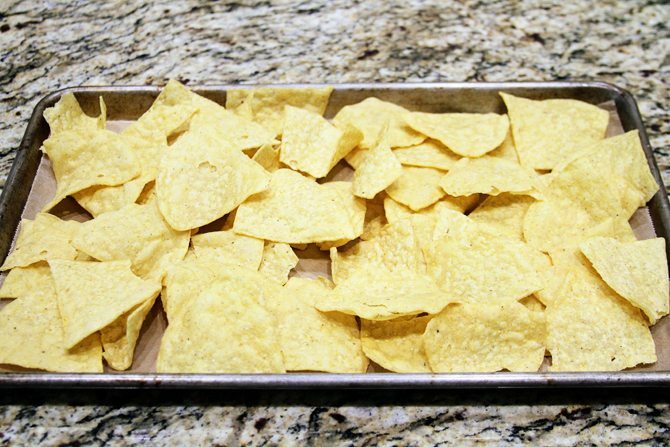 Start by lining a jelly roll pan (about 10×15-inches) with parchment and add a decent covering of tortilla chips to cover the pan. Next, use a spoon to drop dollops of the Price*s Pimiento Cheese Spread onto the chips. I used the whole container, but feel free to use as much as you wish. Now, top that with pulled pork, about 2 cups. I used a sauce-less pulled pork out of the refrigerated section of the grocery store, but you could use homemade or stop by your favorite bbq joint for some. Whatever floats your boat. 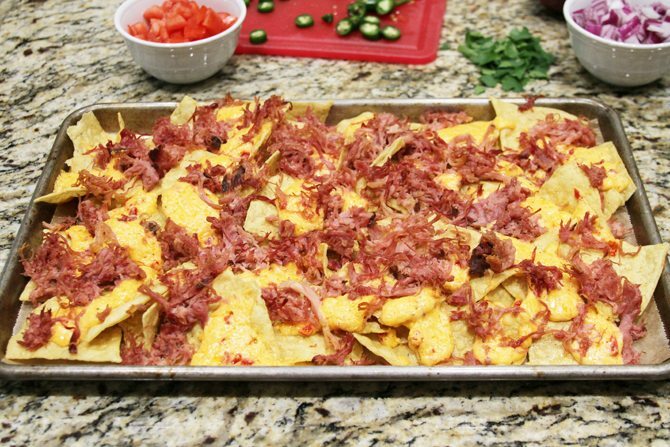 Bake the nachos in a 325°F oven for about 10 minutes or until the pimiento cheese is melty. (Is that a word? Melty? Well, it is here!) The best part of this is the chips get extra crispy in the oven! Preheat the oven to 325° F and line a 10x15-inch pan (jellyroll pan) with parchment paper. Use enough chips to generously cover the bottom of the pan. 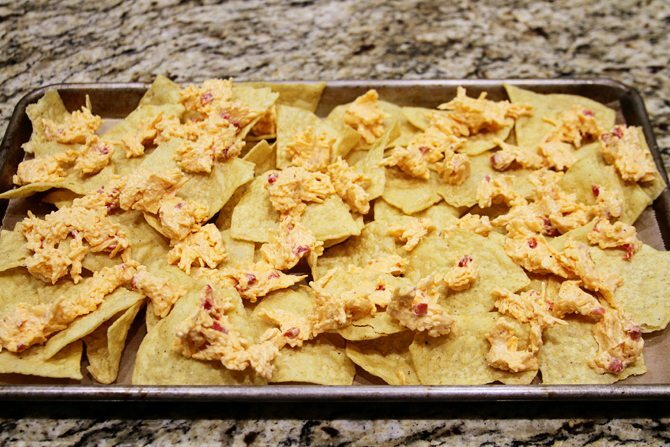 Drop dollops of the pimiento cheese spread onto the chips. Sprinkle the pulled pork on top. Bake for about 10 minutes or until the pimiento cheese starts to melt. Remove from the oven and top with the onion, chilies, salsa, and cilantro. 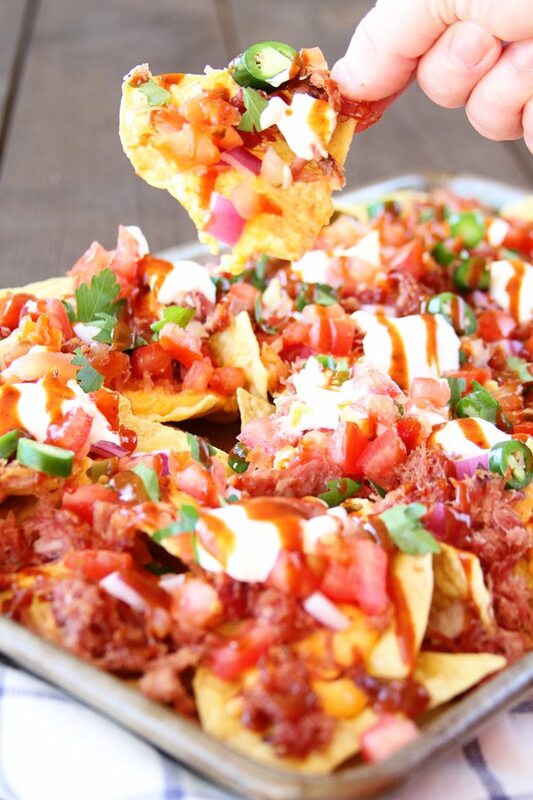 Add dollops of sour cream and drizzle with bbq sauce to your liking. Make this recipe your own by adding your favorite toppings! Add a little or add a lot! Oh!!! Have Mercy!!!! This could cause a riot it sounds so good! They are seriously that good! Will be stopping at the grocery store on my way home! Sure hope you enjoyed them!! 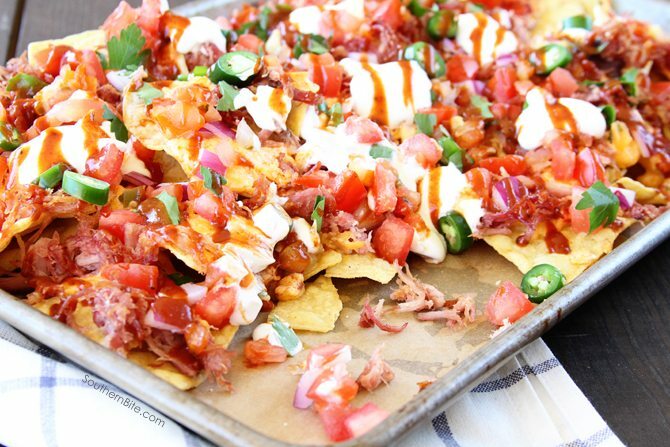 Nachos are such a weakness of mine! My favorite thing is to have a pina colada & a plate of nachos while reading by the pool or beach. That’s what my dreams are made of! I sure hope you’ll enjoy them! Yum! I recently made cheese fries with pimento cheese and wondered why in the world it took me so long to think of it. Why haven’t I used it for nachos yet? These look amazing! 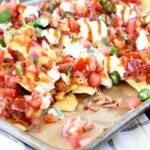 I love nachos and pimento cheese, but have never tried the two together. I might have to make this for the weekend bbq coming up. Sounds delicious. They are so, so good! I even surprised myself. It’s about time to make them again. 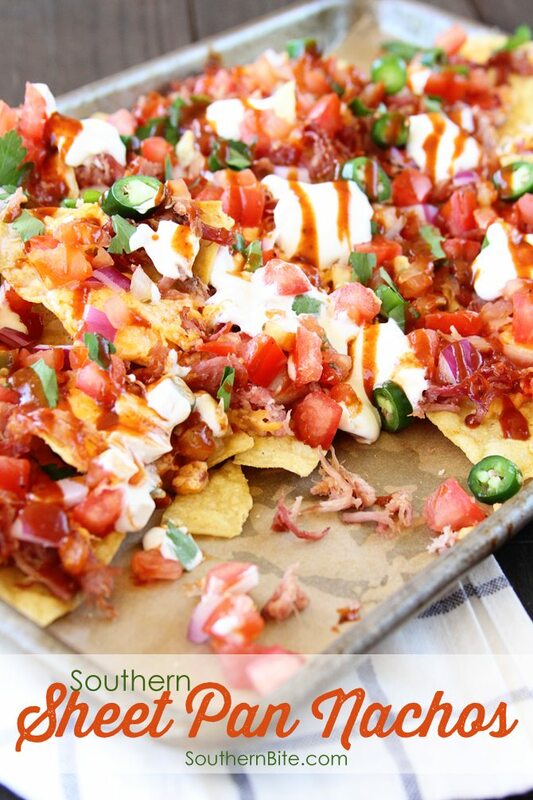 Pimento Cheese and smoked pork nachos??? Heaven Southern style!! I haven’t seen that particular Price’s spread. Is it a new product? 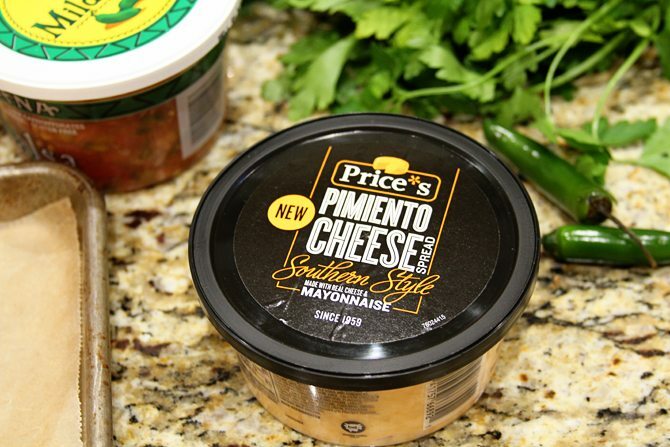 Would love to try the recipe – could I substitute another pimento cheese? It is a newer products and it’s not as sweet as the traditional one they sell. Making these as we speak and they smell DELICIOUS! Hope they based as good as they smelled!